Each of my grand kids have their own special fruit tree. It’s something they have each gifted to me on their first birth year. The trees are now starting to bear fruit and they love it. 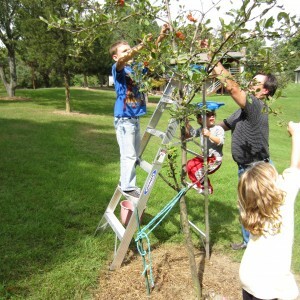 Today was a perfect day for visiting our local orchard. We came home with a big bag of apples for applesauce plus the kids got to pick fruit from their apple and pear trees to contribute to the batch of homemade applesauce. Oliva (age 5) is making apple/pear sauce. The apples are simmering as I write this post. They should be simmered down within the next hour. Then, the Foley Food Mill is taken out of storage. With just a few twists and turns, you get the best applesauce ever. No sugar added and absolutely pure. We’ll be having the applesauce tonight with grilled salmon and fresh water bass. I’m heading up to the local farm to buy fresh corn on the cob and slicing tomatoes. Vegetable soup (homemade, of course) will be the first course. Washing the apples and pears. 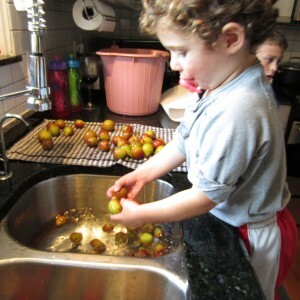 The picked fruit is washed and then cut (seeds, stems an all) and left to simmer in a pot on the stove. This usually takes 1 1/2 hours depending on pot size and the number of apples. Once the apples have simmered down and are soft, they are ready for the Foley Food Mill. This is the grand kids favorite part. It requires manual labor and isn’t anything sophisticated; but it works. Simmer apples on stove top until soft and mushy. Making applesauce requires manual labor.